one. Today I am 25. The big two five. And you know what? This year is going to be a hundred times better than 24- I can promise you that! two. I have some special visitors coming in to town today and I just feel so blessed that I have such loving friends. Even though we all live many states apart, as soon as we're together it's truly like no time has passed! three. 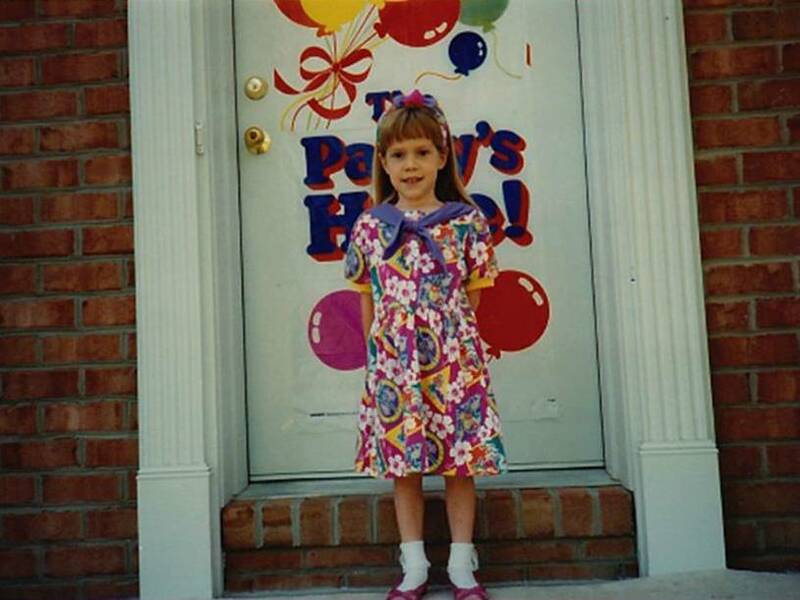 This picture just makes me smile and not just because of my very prim and proper front porch pose- I just look ready for a party, don't I? I remember my mom putting that banner on our front door for every birthday celebrated in that sweet house. There are some precious memories wrapped up in that banner she unfolded each year. Memories of balloons tied to the mailbox, slumber parties with matching pj's, the paint boxes my grandpa made for my "art party", the one we have to move in and out of the garage with the rain, a particular Star Wars themed 12th birthday, and the echo of many "happy birthday to you's..." shouted as I blew out candles on my favorite angel food cake. four. as much as I wish birthdays meant a day off work I do love that my co-workers always make me feel special and that they know sweets are my love language. five. I am peacing-out early today to get mani/pedi's with my girlfriends! The perfect way to start the birthday festivities. Hope everyone has a wonderful Friday and a happy rainy weekend! Happy birthday - have a great day and weekend. Happy Birthday!!!!!!!! Twenty-five times over! Happy Birthday!! 25 was a great year for me and it will be for you too! happy birthday, 25-year-old!! ;) hope you have a wonderful weekend celebrating another year. Visiting from your mom's blog. Happy Birthday! Hope it's the best one yet and that you have many more to come. Happy Birthday! Your Mom's friend, Kim from NJ! Hope its a good year from you!